So I had this idea and knew i wouldnt be able to explain it well so i said hey ill just draw it on paint... well I soon figured I hate digital drawing with a passion! well i hope the drawing gets my point across. My idea was to try to add an oven to the rocket stove principle and I just wanted feedback on the best ways to experiment with that. this drawing is by no means to scale but i got as close as I could... So my thought is if the heat from the heat riser hits a metal box with a door on the front. the heat would them pass by 5 of the 6 sides of the box then out to the exhaust. I just wanted to see peoples feed back on the hot water idea as well by useing thermosyphoning. OK now tell me everywhere i might run into problems AND!!! how to fix them! thanks! I, too, have been trying to brainstorm for such an idea- creating an all inclusive system running off of one RMH. 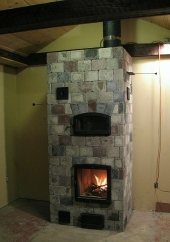 The more I research, the more I realize how its easy to inhibit the function of the RMH as a super efficient wood stove. 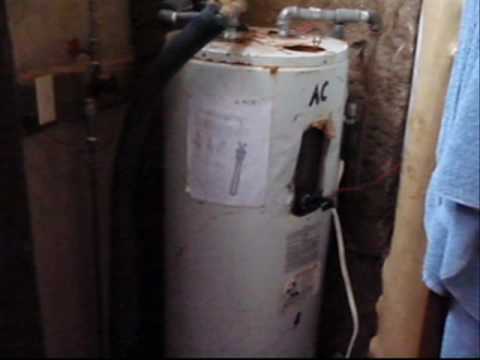 I think the water heater is very doable, if well planned, thought out and executed. It seems to me, if you allow yourself to either use an outside (Ernie's double chamber cob oven seems excellent) or somehow rig up an attachment to store or insulate heat for the oven function. Though, I am also curious about thermosiphoning capabilities w/ RMH. Heating batches of water, I think, would be preferable. I believe it has been mentioned the problems with constantly using water as a thermal battery on these forums. I've considered getting rid of the RMH water heater idea, using a passive solar design for decently hot water for daily stuff and instead having a bath tub that has its own smaller RMH that can store heat for nice long hot baths, perhaps using ferrocement, as its been used for cisterns, but I'm unsure of its thermal capacity or if it would hold up under high heat from the RMH. But for a smaller place or for someone living by themselves, that may be a bit impractical. Just a few thoughts- I have yet to construct a RMH, so keep that in mind. you can build an oven right on top of the barrel no redesign needed. just a bit of insulation. Water heating is something everyone moves to when thinking about rocket stoves. its not hard to heat water, it is hard to heat water in the right place so you dont mess up the function of the stove. 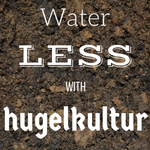 Water is thermal mass and the best way to deal with it is that you have little thermal mass other than water. They talk about heating water with rmh's and safety. I just came across someone who heated their hot water tank using a rocket stove concept, but not a RMH. They have been heating their hot water for 2.5 years according to their website. Here's the link if you are interested. I posted some details in the forum a few years ago of us using a little pocket rocket to cook and heat water. The system can also heat two upstairs radiators. This is useful if you have an existing back boiler and it is already tied in to a solar water heater. We normally only use ours in the summer to concentrate the heat where we want it, when we don't want to heat the house - as the chimney retains a lot of heat because of its thermal mass and the fact that it's built on a slant. Whenever you selecting a new water heater for your home, only choose a water heating system that will not only provide enough hot water but also that will do so energy efficiently & money saving. This includes considering the different types of water heaters available and determining the right size and fuel source for your home. I have looked at all kinds of water heating. Yes we need a tank to hold the water. Thermosiphon works great. But which is better to heat the water. A Water Jacket around the exhaust or a Copper Coil wrapped around the heater or exhaust, then into the storage tank. Has anyone compared them? I have put bucket of water on top of a stove and that had taken a while to heat up. In that video you see the water pulsing. I think it's being "pumped" by steam bubbles. From my admittedly limited experience with solar thermo-siphon I have learned a few things. 1. The bottom of the water storage tank should be a foot above the top of the coil, higher if you're farther away. 2. Where the hot water enters the tank should not be above the water level - needs to enter the side of the tank, not 6" above the top. 3. His lines are too small. Good thermo-siphon has the weight of the denser cold water forcing the less dense hot water out of the coil continuously so you need vertical distance between coil and tank. Coils will usually boil because the water can't move fast enough, especially small diameter pipe. Better to accept less efficiency and use much bigger pipe, at least 1/2" or a straight vertical pipe. If the coil boils near the bottom it can stop the flow as the resistance of flow through the coil can overcome the tiny difference in pressure between the hot and cold water. Also the TOP of your water heating pipe should be in the hottest place. 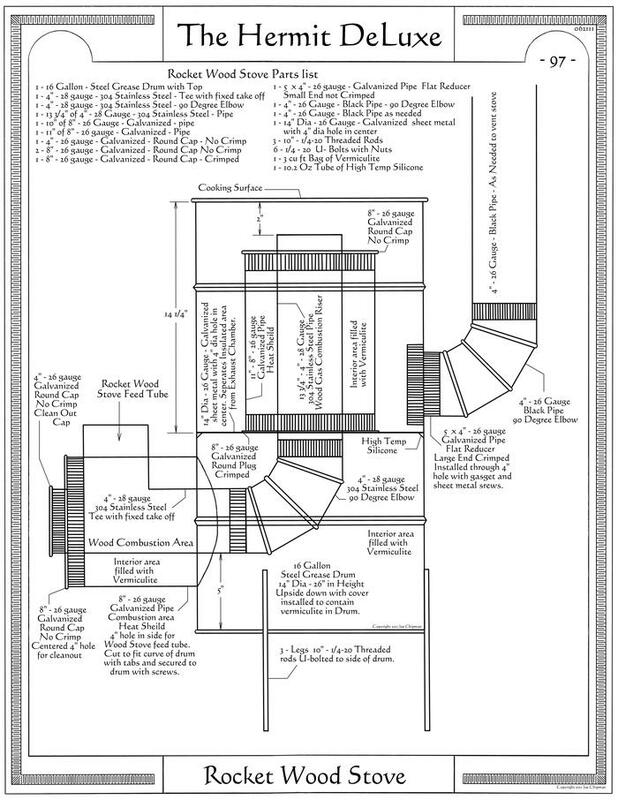 The best setup is probably a straight pipe that enters the stovepipe and hugs the edge at first and is in the center of the hot airflow just before it leaves the stovepipe. Ideally the bottom of your tank should be higher than the hot water exit from the heat source. A coiled tube is kinda like a rocket stove with a horizontal flue - low flow. Vertical pipe gets the same rocket effect going and helps push things along. Water is a fluid just like air but much denser. You could use a serpentine coil as long as it isn't right in the exhaust flow. Wrapped around the barrel is OK but you have to have a good physical connection to get good heat transfer. Even then, you'll have dissimilar metals in contact and just a little corrosion will hurt you there. The hotter that part of the barrel is the more vertical the pipe needs to be so down near the bottom your coils could be tighter than near the top. Roy Hinkley wrote: In that video you see the water pulsing. I think it's being "pumped" by steam bubbles. From my admittedly limited experience with solar thermo-siphon I have learned a few things. Yeah, his design is really close to a pop pop boat. He has a check valve, so it pulses in only one direction. There are tons of heat wasted, since the flow is so little, and the water and the lines are always very hot.